jaanika: Review: Manhattan eyeshadow base. 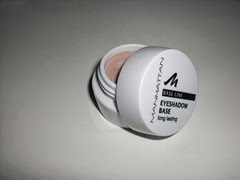 The eyeshadow base comes in a little pot with a screw lid. It is a light beige color with a tiny, tiny bit of shimmer that hardly shows up on the lid. It had quite a woody, herbal smell that reminds me of a sauna.It worked reasonably well for a few months However, after a few months the product dried to a putty-like consistency and I can't even apply it anymore, it just smudges and smears in little clumps.So this was kind of a waste event though it was rather cheap, as I'll have to chuck it already and there's still a lot of product left. Have u tryed it before? Tell me some good eyeshadow primer that i can use? I use Lumene Eyeshadow Primer and I really like it.